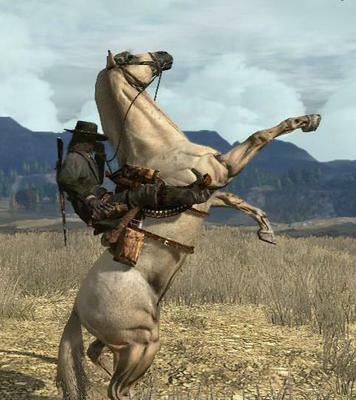 NOTE: Yes, I know the picture is a video game horse. But 'Murray' is not a real horse, and I just thought it would be fun to make this thing up. Comment what you think. This is set back kind of in the 1800's, so it will be based off old-timey times, so don't be all like "Wut" when you read this. Hey. I'm Murray. I'm a Grey Hungarian Half-Bred stallion and I have an owner named Jake, who thinks he is everything. He makes me rear for the ladies, when he sees some, anyway. And he has a girlfriend. Weird. Sometimes, I wonder what floats around in his little mind. Some days I tell myself I will clear the debris out of there with my back hoof, but then I think, that would be rude. To do it in public. I tried one day in private but I missed. Woops. One day, we were traveling the Plains, and we saw his girlfriend on her horse. She's half Indian, so she told us to head up the mountain and see old Nekoti Rock, there was an Indian camp up there. Jake said he would and didn't. LIAR. Instead, he took me for a swim in the old Greenhollow River. I LOVED swims. Was obsessed. So the first thing I did was jump in like some kind of crazy. Well, let's just say it was a stupid mistake. The next thing I heard was "AHH TOO COLD!" "AHH TOO DEEP!" And I couldn't feel my feet touching the ground and I got that sinking feeling. So, being a horse, I flipped. Water splashed everywhere and it got all in my eyes and Jake was up there screaming.. I thrashed until I eventually found my feet again and we both calmed down. Funky day. Look out for Entry 2. Kinda weird, and not 'old-timey' like you said. I am pretty sure the word 'Funky' wasn't invented yet in the 1800's. Please comment or no Entry 2.